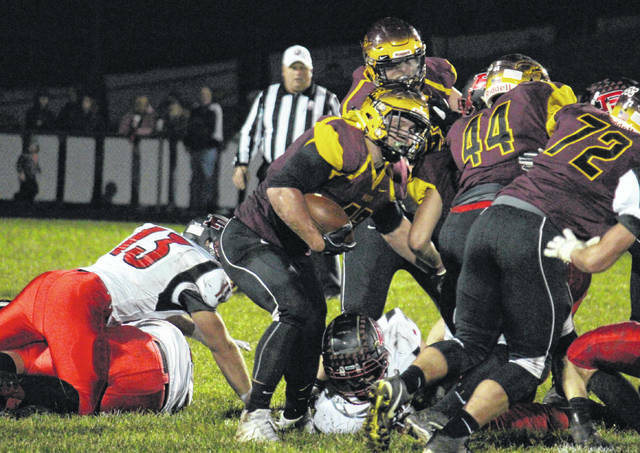 Meigs sophomore Abe Lundy (center) crosses the line of scrimmage behind blocks from Noah Metzger (44) and Andrew Dodson (72), during the Marauders’ non-conference setback on Friday in Rocksprings, Ohio. ROCKSPRINGS, Ohio — Back and even better. After back-to-back bye weeks, the Point Pleasant football team returned to the gridiron with a season-high 603 yards of total offense, leading the Big Blacks to a 55-13 victory over the Marauders in a non-conference game on Friday in Meigs County. 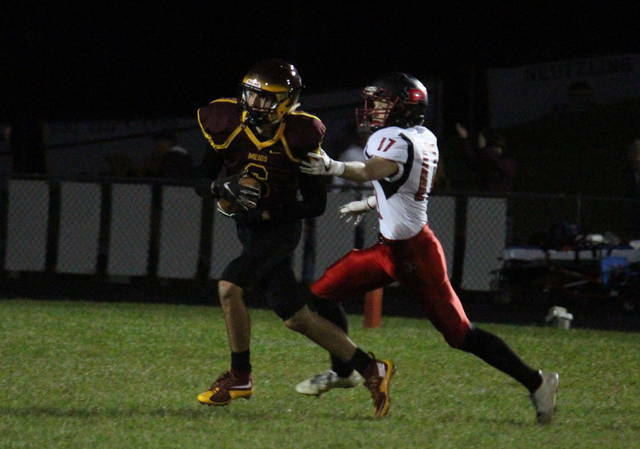 Meigs (2-6) — which was held under 300 yards of total offense for just the second time this season — picked up a pair of first downs on the game’s opening drive, but had a touchdown called back because of a penalty, and then fumbled the ball away on the PPHS 20. Nate Barth recovered the loose ball for Point Pleasant (6-0), but the Marauder defense came up with a takeaway of its own on the ensuing PPHS drive, with Ty Bartrum intercepting a pass and returning it 43 yards for the game’s first touchdown. Levi Rafferty kicked in the extra point, giving MHS a 7-0 lead with 6:59 to go in the first quarter. The Big Blacks answered quickly, covering 65 yards in 1:30, with Cason Payne tossing a 27-yard touchdown to Brady Adkins, and Oliver Skeie making his first of five successful point-after kicks, tying the game at seven. The PPHS defense came up with a three-and-out on the next drive, and visiting offense took over with just 38 yards to paydirt. With 2:10 left in the first, Payne delivered the go-ahead score for the Big Blacks, rushing into the end zone from 14 yards out. Early in the second period, Point Pleasant’s defense forced another punt and its offense made it into the red zone, but was backed up to the 22 after a penalty. The Marauder defense stopped the Big Blacks on fourth down, but MHS was forced to punt the ball back after picking up a pair first downs. Payne found paydirt again with just 55 seconds left in the half, this time rushing in from three yards out to give the guests a 20-7 lead. Meigs made it deep into PPHS territory, but failed to convert a fourth down on the final play of the half, and went into the break down 13. Point Pleasant’s lead grew to 19 just 1:24 into the second half, as Nick Parsons capped of a 56-yard drive with a one-yard run. The Marauders returned the ensuing kickoff to the PPHS 25, and hosts trimmed their deficit back to 13 points with 9:48 left in the third, as Coulter Cleland found Cole Adams for a 29-yard touchdown pass. Point Pleasant only needed 1:24 to get those six points back, however, as Adkins completed a 58-yard drive with a three-yard touchdown run. This time, Payne found Josh Wamsley for the two-point conversion, making the margin 34-13 with 7:24 left in the third. The Marauders suffered their second lost fumble of the game on their next drive, and Josh Wamsley recovered the ball for Point Pleasant at the MHS 41. Adkins earned his second rushing touchdown of the period from two yards out with 5:09 left in the period, making Point Pleasant’s lead 41-13. After an MHS punt, Adkins was in the end zone again, this time catching a 49-yard pass from Payne with 14 seconds left in the third. The Marauder offense made it into PPHS territory on the next drive, but the Big Blacks came up with a fourth down stop to restore possession. The final touchdown of Point Pleasant’s 55-13 victory came with 3:16 to go, when Christian Holland scored on a five-yard run. Following the win, Point Pleasant head coach David Darst gave credit to the Marauders for forcing the Big Blacks into some difficult situations early on, and he was happy with how his team rebounded in the second half. “We were making some mistakes early in the game,” Darst said. “Can you attribute it to being off three weeks? Also, it could be the fact that the Meigs team is not a bad team. They do a lot of good things, and they did a couple things to us in our passing game that we weren’t ready for. They ended up flushing Cason out to get an interception. Along with a 608-to-263 advantage in total offense, Point Pleasant chalked up a 367-to-19 edge on the ground. The Big Blacks earned a 24-to-9 advantage in first downs, and won the turnover battle by a 2-1 tally. Meigs was penalized eight times for 64 yards, while PPHS was sent back four times for 35. Marauders head coach Mike Bartrum held himself responsible following the setback, and he noted that his team can still finish the season on a high note. Payne — who was intercepted for the first time since last season when these teams met — carried the ball 14 times for 151 yards and two touchdowns, while completing 12-of-18 passes for 207 yards and a pair of touchdowns. Adkins carried the ball 20 times for 158 yards and two touchdowns, while catching five passes for 144 yards and two more scores. Zane Wamsley had 51 total yards on one carry and two catches, while Josh Wamsley combined three receptions and two totes for 48 total yards. Holland carried the ball twice, scored once and gained 13 yards, while Parsons scored from one yard out on his only try. James Musgrave and Joel Beattie had two receptions apiece, gaining 23 and 19 yards respectively, while Aiden Sang caught one pass for one yard. Hunter Bush was 3-of-4 passing for 34 yards, all on the Big Blacks’ final drive. For the Marauders, Cleland completed 21-of-32 passes for 244 yards and a touchdown. 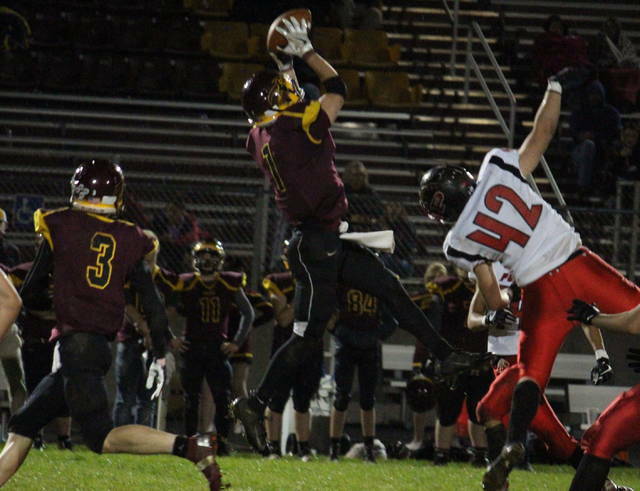 On six receptions and seven carries, Zach Bartrum had team-highs of 108 yards and 12 yards respectively. Ty Bartrum caught a game-best seven passes for 46 yards, Weston Baer hauled in three passes for 24 yards, while Adams caught two passes, earning 34 yards and one score. Wesley Smith caught two passes for 14 yards, Landon Acree added an 18-yard grab, while Abe Lundy finished with two carries for eight yards. Point Pleasant has now won three straight bouts with Meigs, and improves to 16-5-1 in the all-time series. In Week 9, Meigs’ final home game will be against Wellston, while the Big Blacks travel to Logan County to face Man.